The Compassion Games International is a year-round non-profit initiative incorporated in Washington State. Compassion Games offers fun and creative ways to ignite and catalyze compassionate action in communities around the world. In the annual Compassion Games, competition becomes coopetition as teams and individuals challenge one another to strive together to make our planet a better place to live through community service, acts of kindness, and raising monies for local causes. The Games amplify what is already working in our communities and inspires increased engagement, leading to new activities that bring compassion to life and improve our well-being. The featured Compassion Games are two annual “coopetitions” in April and in September. In addition to an ongoing Compassion Game called Build a Global Fire of Compassion. In the past, we have also hosted MLK-ALI Games in January, World Interfaith Harmony Week in February, and The Giving Games in December. The Compassion Games adapt creatively to any community who wants to embrace and play them. Since 2012, players of the Compassion Games have served over 15,000,000 people in more than 40 countries by over 1,000,000 reported volunteer players. The Games have been played between cities, businesses, faith and interfaith organizations, schools, and even prisons. Participating teams in the Compassion Games perform acts of kindness and service, reporting on the number of volunteers, hours of service, money raised for local causes, and the number of people served, providing measurable results that can be improved upon, year after year. Players can participate in the Compassion Games as an individual by performing acts of kindness, such as visiting someone who is sick, acknowledging the kindness of a stranger, cleaning up litter, or volunteering to support a local cause. Players can also join or organize a Team that may include friends, families, co-workers, classmates, congregants, or our neighbors, and can organize or join service projects to give back to our communities. Service projects can strengthen what is already taking place or lead to new projects, such as distributing clothing to the homeless, planting a community garden (and donating the food! ), or helping a neighbor with home repairs. After the acts of compassion and service projects have been completed, teams and individuals report and reflect on their activities and outcomes on a Compassion Report Map to measure impact and inspire others to get involved. Through these Compassion Reports, we are able to measure and benchmark the collective impact that our actions have on our world, allowing us to challenge ourselves to be more compassionate as we increase our capacity to bring compassion to life, year after year! Catalyst to Ignite Engagement: The Compassion Games reframe play and competition by turning “competitive altruism” and “friendly-competition” into “coopetition” amongst and between different teams to create excitement and motivate interest in participating. Amplifier of What’s Already Working: The Compassion Games can strengthen and amplify what is already working in a community. Weaving together existing events and activities from different groups and organizations catalyzes a shared collective impact. The Compassion Games also inspires new events and activities that build upon existing efforts. Framework and Baseline for Measuring Compassion Strength: The Compassion Games measure community service through the number of volunteers, hours of service, monies raised for local causes, and numbers of people served. Results create a baseline for building a team’s compassion impact and value over time, strengthening our individual and collective “compassion muscles.”. Engaging Environment for Reflection and Learning: The Compassion Games offer a means for engagement and reflection which transfers the experiences from the Games to the real world. Composing and sharing Compassion Reports that include these reflections helps players build the skills needed to act more effectively and compassionately with ourselves and our communities. Platform for Cultivating Open Participation: The Compassion Games offer an open-source, “Do-It-Ourselves” creative platform. The Games tap into a growing capacity and desire to engage with compassion in ways that go beyond theory and passive consumption. The Games are open, participatory, peer-driven, and a thriving example of open-source collaboration. Connection to a Global Movement: The Compassion Games are a part of an international compassion movement that inspires participation in something greater than oneself. The Compassion Games help us to understand, connect, and learn from each other while co-creating a global culture of kindness. The Compassion Games have inspired innovative and meaningful ways to engage communities. For example, Metro Detroit used the Games to identify many of the places in Detroit that they cherish and love. The goal was to heighten appreciation of their physical environment, their sense of social cohesion, and their experience of safety and peace within their neighborhoods as a regenerative response to racial violence. Read the “Love the Hell Out of Metro Detroit” story here. In the 2015 Annual Games, community organizer Charles Barker and his team Compassionate Richardson-Fort Worth in Texas – which included over 200 volunteers from 15 non-profits and 15 houses of worship – packed over 20,000 meals in just one day to feed children in need. When Chick-fil-A caught word of their astonishing acts of compassion, they contributed an additional 250,000 meals with the help of 7 high schools. This led to the launch of an effort that used the service power of 340 schools to pack a remarkable 1,000,000 meals to help feed children across the United States. Read the “From 20,000 to 250,000 to 1,252,160 Meals Feeding Children Everywhere!” story here. One of the most touching stories from the 2015 Annual Games came out of Louisville, KY when acts of hate defaced the Louisville Islamic Center in red graffiti just days before they were to receive an award – the first Compassion Bench – from the Partnership for Compassionate Louisville, the team participating in the Compassion Games. Thousands of people from all backgrounds showed up to support the Islamic Center in this difficult time, helping to remove vandalism and transforming hate into a powerful healing that brought the local community closer together. Read the “Acts of Intolerance Make Compassion Bench More Meaningful Than Ever” story here. Educator Rahbin Shyne has used the Compassion Games to bring about compassionate “climate change” at her high school in south Los Angeles over the past two years. In 2015, former gang leaders participated in the Games and channeled their energy into a force for good. Listen to Rahbin Shyne describe the impact of playing the Compassion Games at her school. Mayor Greg Fischer from Louisville organized Give-A-Day during the Mayor’s 2015 Week of Service where 50,778 meals were packed by volunteers for Kids Against Hunger, 6 abandoned houses were renovated/new homes were built and 12,418 volunteers helped to clean up Louisville. Read the story about Mayor Greg Fischer and Give-a-Day here. In North Thurston County, Washington State, 50 schools participated in 2014 by forming a currency, called “Coins of Compassion”, given to anyone who committed an act of kindness, whether that be a student, teacher, or administrator. Read the Coins of Compassion in Schools story here. A women’s correctional facility in California has played the Compassion Games for three years. In 2014 over 10,000 acts of kindness were reported and there was an unprecedented 11 days without violence. Read how the Games were played in a Women’s Correctional Facility here. Read a 2015 the Good News Network story about the Games played in prisons. 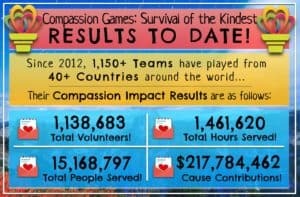 In 2012, there were two teams in the Compassion Games, Seattle and Louisville. In 2013, two teams grew to 19, and in 2014, there were 159 teams. In 2015, over 200 teams from around the world directly served over 500,000 people. For the past 4 years, the Compassion Games has sustained itself on grass-roots ruggedness, small philanthropic donations and sponsors. From students challenging one another to bring compassion into schools, to people in prisons showing kindness to one another with unprecedented incidences of no violence, the Games have surprised the world at their ability to adapt creatively to any community who wants to embrace and play them. How Can Compassion and Play Change the World? Compassion is an antidote to the fear, disconnection, and social isolation of our time. Scientific research abounds in revealing the intrinsic human necessity for compassion to flourish in our personal, professional, and civic lives. As a profound source of power within each of us, playing with compassion inspires us to connect authentically with one another, rejuvenating our spirits as we actively live into a positive vision of our world, together.